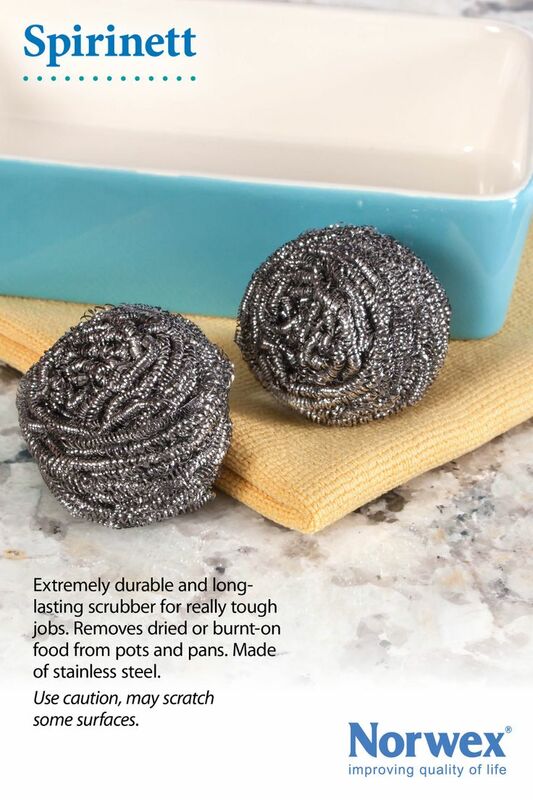 Rust-proof stainless steel scrubbers in a two pack. Can only be used WET. WHERE TO USE: Heavily soiled areas where a little elbow grease is needed. Great for tiles, coffee pots, burned on foods, removing oven grime and build up, oven racks and trays, removing lime and rust marks, removing burnt on food from pots, BBQ’s, removing water marks on taps, cleaning algae from fish tank. USE CAUTION as some surfaces may scratch. Do not use on Teflon coatings, porcelain and auto paint, or on surfaces that may scratch. Oven doors with a tinted glaze (normally only newer ovens) may also scratch. Test is in an inconspicuous corner. HOW TO USE: Wet the surface to be cleaned and also the spirinet. Apply light pressure to clean. May also be used with the Oven & Grill cleaner. MAINTENANCE: Rinse with hot water and a little detergent. You can buy the Norwex Spirinett online from me in Australia, or if you are in Canberra contact me to see Norwex in your home. If you are elsewhere, check Norwex.com to find a consultant in your country. Of course, if you already have a Norwex consultant, you can contact them directly to order.